Can the Asian economic miracle be replicated in Africa? This question has been brought to the fore by the remarkable recent book “How Asia Works” by Joe Studwell, former editor-in-chief of the China Economic Quarterly. In his book, Studwell appropriately credits the crucial role of land rights reform in Taiwan, South Korea, China and Japan in helping to spark and enable the sustained economic growth of those Asian tigers — growth that started in the agricultural sector and then fed the manufacturing sector. Studwell asserts that land rights reform was one of three factors for successful Asian economies, giving a kick-start to development by using a large rural workforce and providing capital for growth. What are the lessons for sub-Saharan Africa, which has not yet leveraged its abundant agricultural land and natural resources to generate shared and sustainable growth? It is tempting to respond to Studwell’s book by searching the sub-Saharan African landscape for a modern Wolf Ladejinsky, who, history buffs will recall, was the remarkable American mastermind behind the post-World War II land reform efforts in Japan and Taiwan. These ambitious programs redistributed vast swaths of land away from wealthy, powerful landlords and gave rights to that land to the poor farmers working the land — helping end extreme poverty and hunger in these geographies and changing the course of history. However, the challenge in sub-Saharan Africa isn’t that land ownership is concentrated in the hands of a powerful elite that lord over their manors seeking maximum output for minimum investment. The challenge is that most land in Africa is not securely controlled by anyone at all. Why not? Because land rights are poorly administered and not clearly defined. A recent World Bank report estimates that 90 percent of the land in Africa is undocumented — with no one person, family or community enjoying secure rights to it. This makes the land highly vulnerable to land grabbing and expropriation with poor compensation. The recent trend of land grabs has only helped to highlight the need for more clearly defined land rights, better land governance, and other protections for smallholder farmers. Particularly vulnerable and insecure are Africa’s women farmers — who perform almost half of the agricultural labor but generally access land only through male relatives. This in no small way undermines efforts to address poverty alleviation and nutrition. 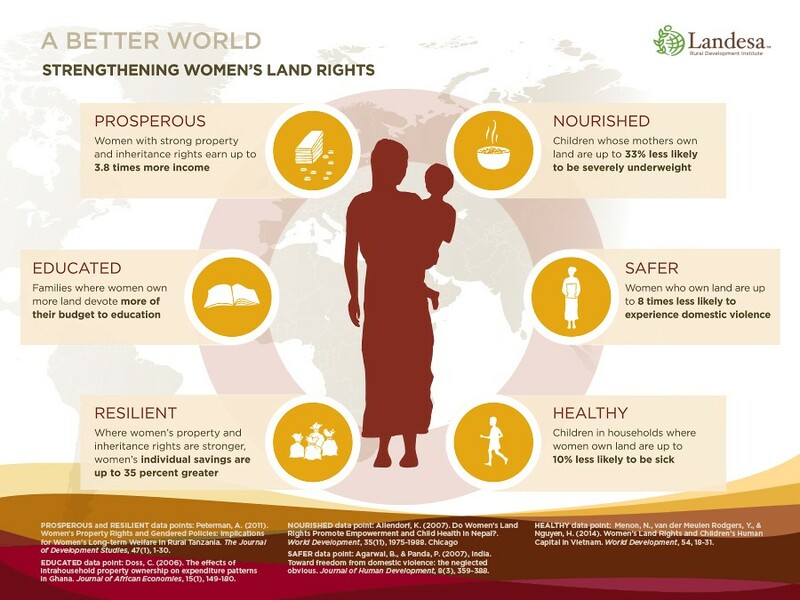 Check out this new infographic for data on how families benefit — in particular on poverty alleviation and nutrition — when women enjoy secure rights to land. Unclear land rights, undeveloped land tenure institutions, and women’s lack of control over the most fundamental asset in the rural societies in which they live — land — isn’t just a recipe for stagnant growth and anemic agricultural returns, it is a trigger for conflict. Rwandan farmer Liberata Batezimisi knows this all too well. Her neighbors were in constant conflict over land, as none of them had secure rights to their farm. They continually tried to steal her land by plowing over her crops and planting their own. And her husband also undermined Liberata’s efforts to pull her family out of poverty, selling off small parcels for a song while he was under the influence of alcohol. Again and again, Liberata spent what little savings she had to take neighbors to court to get her land back. Liberata told us, at any one time, it seemed like half the village was involved in land-related legal disputes. Liberata viewed any investment in her land as risky — including high quality seeds and fertilizer — because of her tenuous control over her land. Then, in 2008, as part of a national formalization and titling drive, Liberata and her neighbors received a simple document that gave her for the first time legal rights to her land. The security she gained promptly changed her planning horizon. Liberata is now investing in her land and her harvests and family’s nutrition have improved. She told us that her neighbors have stopped trying to grab from each other, her community is more peaceful, farms are more productive, and her own children are better fed. Rwanda’s efforts to document the land rights of every parcel in the country is not the only sign that important progress is being made on land tenure in sub-Saharan Africa. Kenya is in the midst of a comprehensive reform of its land laws and policies, as is Uganda. At the request of the Kenyan and Ugandan governments, Landesa has been involved in each of these efforts. Certainly, fixing land tenure alone will not transform Uganda into Africa’s tiger economy. But it is perhaps the best first step to providing smallholder farmers with the sort of security, opportunity and incentive to invest in the their land and a fighting chance to feed their families and communities and build a better future. Tim Hanstad is president and CEO of Landesa, a global nonprofit that works to secure land rights for the world’s poor women and men. He has over 20 years in project management, research, consulting, policy advocacy, training and writing on issues of expanding land access, improving land tenure security and developing land markets for poverty alleviation and economic growth in developing countries. Hanstad has collaborated with the World Bank, several U.N. agencies, USAID, the DfID and the Bill & Melinda Gates Foundation.